Adventists in Dominica share their fears, challenges, and hopes after Hurricane Maria. Months after Hurricane Maria, most of Dominica is still without power. The streets are cleared of debris, but there are plenty of rock slides and collapsed roads. People have organized piles of twisted metal to be picked up for recycling. Almost every home is covered with blue tarp because new roofs are difficult to come by. As for the churches, people are making do with what they have. In the case of the Beryl congregation, this means squeezing into the pastor’s home. Since the hurricane, about 70 people have been cramming into the local pastor’s living and dining rooms. Chairs flow into the kitchen, the hallways, and out the front and back doors. It’s uncomfortable, but it’s the only option they have. The Beryl church, built in 1988, is gone. It sat atop a hilltop on the northeastern side of Dominica, overlooking the Atlantic Ocean. Its beautiful location left it vulnerable to the savage winds, and three out of the four concrete walls toppled over during the night. Further north is the Woodford Hill community. Their church lost its roof, and rain ruined everything in the building, including audio-visual equipment. Ultimately, the building was seriously compromised, and it must be torn down. Fifty people gather in the remaining basement each week, where water seeps through the ceiling and drips on the members during worship. In the west, the Tarreau church was obliterated. What remains is a red slab. The congregation now worships under a canopy. In the south, the Boetica church lost two walls and all their pews. The small congregation has dispersed to homes for worship. 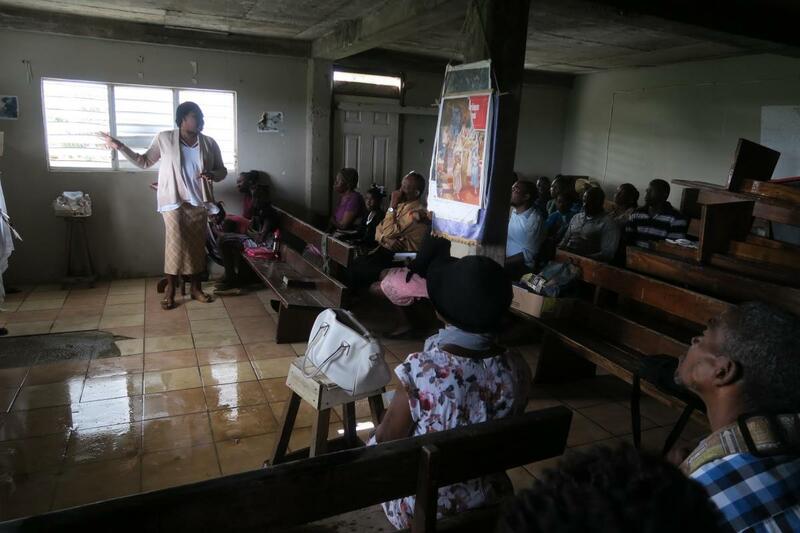 In the east, the Carib Territory church is without a roof, windows, or doors. 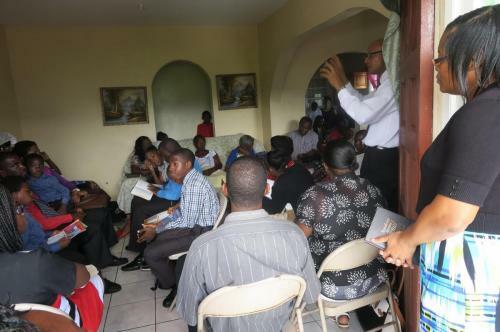 Currently, the group meets in a borrowed space, but Lester Joseph, pastor of Carib Territory, hopes it won’t be for long. Stories like this are plentiful, but at this point Maranatha Volunteers International cannot help them all. However, if the situation is a good fit for what Maranatha can offer, the work will start this year. Already, a volunteer group is scheduled to work on the Beryl church in May, and other teams are lining up to help. In the last two years, Dominica has been going through a time of tribulation due to weather-related disasters. In August 2015, tropical storm Erica dumped an estimated 33-inches of water on land that was already saturated from previous rains. Subsequently, Dominica suffered catastrophic flooding and mudslides. Multiple people were killed. Until Maria, it was considered Dominica’s worst natural disaster in decades. Now, Dominica faces another threat. Hurricane season, which starts in June, is looming. Many families and congregations won’t have their structures repaired by then, and the fear is causing some people to give up. Locals say thousands of people have left Dominica to live somewhere else. People have given up on the country. Some Adventists that Maranatha spoke with have a different take. They, too, suffered loss, but they cling to a greater hope found in Jesus. Patricia Honore is a member of the Woodford Hill church. On the night of the hurricane, she and her family were hiding in a storeroom under her house. It had no door, only a tarp. They were battered by rain and wind, and Patricia spent the terrifying night gripping a wooden beam and shielding her small grandchildren from the storm. Honore is hopeful that Maranatha will be able to rebuild Woodford Hill. She is praying that her own home, which was damaged during the storm, will be fixed, although she has no income. No matter what, she says she is grateful for life and God’s mercy. Darnelle Celestine (Dominica Report: Part 1) is counting on this very promise. On the first morning after the hurricane, when Celestine saw what was left of her house, she knew she had to find a safe place for her family. They gathered what they could from the remains of their home, then started walking. All around, they saw such devastation and sorrow. People were standing in rubble, not knowing what to do. Celestine didn’t know what to do either. Dominica was a disaster zone, and it will take months to repair. She, along with thousands of others, were homeless. She and her husband guided their daughters through the broken streets and ended up at the one place they knew would always be home. Their church. It was still standing.